Uyghur or Uighur /ˈwiːɡər/ (ئۇيغۇر تىلى Uyghur tili, ئۇيغۇرچە Uyghurche), umwhile kent as Eastren Turki, is a Turkic leid wi 8 tae 11 million speakers, spoken primarily bi the Uyghur fowk in the Xinjiang Uyghur Autonomous Region o Wastren Cheenae. ↑ Nordhoff, Sebastian; Hammarström, Harald; Forkel, Robert; Haspelmath, Martin, eds. (2013). "Uighur". Glottolog. Leipzig: Max Planck Institute for Evolutionary Anthropology. 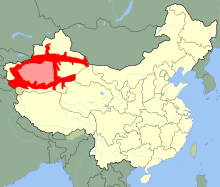 ↑ "Uyghur - definition of Uyghur by the Free Online Dictionary, Thesaurus and Encyclopedia". The Free Dictionary. Retrieved 5 October 2013. ↑ "Define Uighur at Dictionary.com". Dictionary.com. Retrieved 5 October 2013. ↑ In Inglis/Scots, the name o the ethnicity an its leid is spelled variously as Uyghur, Uighur, Uygur an Uigur, wi the preferred spellin bein Uyghur. Уйгурский (язык) (transleeteration: Uygurskiy (yazyk)) in Roushie.